Molydag 210 is a colloidal dispersion of molybdenum disulfide in alcohol. Molydag 210 offers excellent lubrication properties, even under extreme pressures. The material is easily applied by brush, dip or spray methods to surfaces which are not affected by alcohol. It exhibits good adhesion to most substrates and usually air dries in 5-10 minutes. Excess amounts should be avoided. Applications are sliders, rotary shafts, notches, locks and anti-seize thread lubricant. Can be used in small amounts for moving parts in vacuum (after drying). Sold in 30g brush bottle and 20g squeeze bottle. Excellent lubrication properties when sprayed on surfaces or in mechanisms such as locks, sliders and hinges. Works well on most plastics. Can be used in vacuum systems when dry. Other applications are conductive spray for non-conductive SEM specimen to enable imaging at low magnification and making plastics conductive for plating. Sold in 10 oz. (284g) spray can. 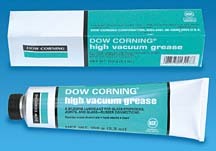 A silicone lubricant for glass stopcocks, joints and glass-rubber connections. Stable from -40°C to +260°C. Not for use in electron microscopes. This superior formulation of silicon mold release is particularly useful for easy release of cold or hot embedding molds. Cured resin embedding can be easily removed from plastic embedding mold when a thin layer of silicon mold release is sprayed on the inside of the mold. Apply a thin coat before loading sample and embedding powder (phenolic, lucite, epoxy or diallyl phatalate) in hot embedding presses. Also prevents sticking of materials such as plastics, rubber and waxes to molds. Contains no CFC, HCFC or chlorinated solvents. Temperature Range: 40°F to 500°F (5°C to 260°C). An extra shipping charge is required by the Carriers when hazardous goods are transported.